[SatNews] The Space Foundation is now accepting nominations for its highest honor, the annual General James E. Hill Lifetime Space Achievement Award. Honoring its late, long-time chairman, Gen. James E. Hill, USAF, Ret., the award recognizes outstanding individuals who have distinguished themselves through lifetime contributions to humankind through exploration, development and use of space, or through use of space technology, information or resources in academic, cultural, industrial or other pursuits of broad benefit to humanity. 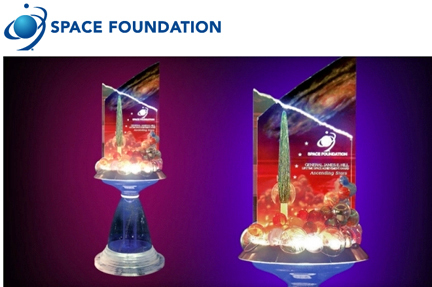 Nominations must be received by Sept. 30, 2014, and the award will be presented at a special luncheon during the Space Foundation’s 31st Space Symposium, at The Broadmoor in Colorado Springs, Colorado, in April 2015. The 2014 award was presented to space program expert A. Thomas Young. Any person may nominate a candidate for the award, with the exception that individuals may not nominate themselves. Upon ratification by the Space Foundation Board of Directors, the honoree will be notified immediately in writing.